Everyone feels that exhilarating lift of energy in the fever of spring. Why not get a REAL boost of energy to make that “spring” in your step last well into summer? This insanely delicious juice will do just that. It combines two of the best fruits of the spring season into a stimulating tropical taste. 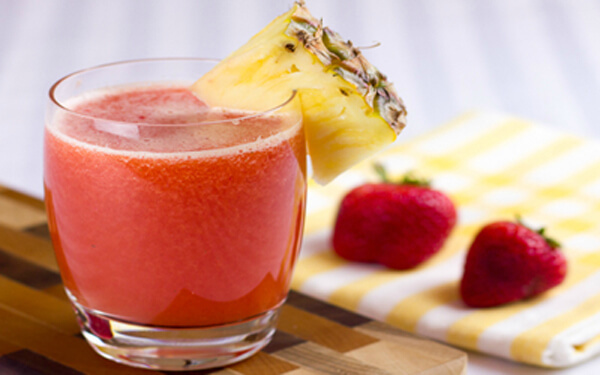 Pineapple and strawberry create a synergistic flavor combination that’s both mildly tart and syrupy sweet. Not only that, but its powerful healing properties will flush toxins out of your body, naturally giving you more energy. And its anti-inflammatory properties heal digestive disorders and improve cold symptoms. In a low-rpm juicer, alternate pressing pineapple slices and strawberries.